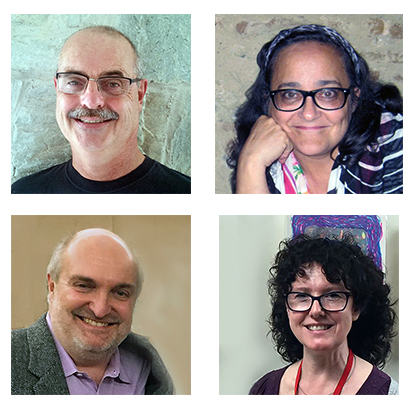 Four people worked together to develop and refine this system: Shelley Thorstensen, Dr. Stefan Bossmann, Katharina Janik Bossmann, and Dale Baggerley. Katharina attended Shelley’s workshop in July 2014 at PMOF. Luckily she had her husband Stefan with her as he is professor and research chemist at Kansas State University (KSU). When we discussed with Stefan “the rag waste problem”, he told us there was an easy answer that would just need some time and testing. As a result, the system was developed through testing and continued discussion via emails and texts. The results were presented at the October 2016 Midwest Regional Conference of the American Chemical Society in Manhattan, Kansas. The description of the rag recycling system was part of the panel “Art in Chemistry” presided by Jason Scuilla, Associate Professor and Area Coordinator, Printmaking and Drawing at KSU. Shelley Thorstensen: BFA Syracuse University, Experimental Studios/Printmaking; MFA, Tyler School of Art/Temple University, Printmaking; Director, Printmakers Open Forum LLC. Stefan Bossmann: PhD University of Saarland, Germany, Chemistry; Postdoctoral Research at Columbia University (Laboratories of Nicholas J. Turro); Professor of Chemistry at Kansas State University. All Print Media (PRINTCAMP!) Workshop 2018 prep! We've got the tents and the mattresses - it's looking great!